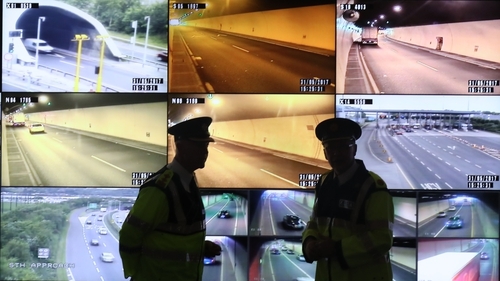 Thousands of motorists using Dublin's Port Tunnel have been warned that special speed cameras will be activated from midnight tonight ahead of the June Bank Holiday weekend. The new permanent Average Speed Cameras at either end of the tunnel will calculate the time taken by each vehicle in the tunnel and any travelling through in less than three-and-a-half minutes will automatically generate a fixed charge penalty notice. The tunnel operator has found that 58% of motorists using the facility drive in excess of the 80km/hr speed limit. Speeds are noticeably higher for southbound traffic coming off the motorway system with 27% of these vehicles driving in excess of 90km/hr. Assistant Garda Commissioner Michael Finn said motorists can slow down and speed up again if they know the location of fixed cameras. But with the Average Speed Cameras there is no incentive in doing this. The cameras installed at the Port Tunnel are the first of their kind in the country and the assisant commissioner said they will be be considered for other locations such as motorways. Traffic levels in the Port Tunnel have increased by 40% over the past five years and it now handles approximately 650,000 vehicle journeys a month.